Carlisle United have completed the signing of former Preston North End and Stoke City winger Lewis Neal on a six-month contract. Neal, 27, has moved to Brunton Park after agreeing a termination package with the Lilywhites. "We have had to fight off a number of other clubs to get him to come here," Carlisle boss Greg Abbott told BBC Radio Cumbria. "He's a Championship player and one we feel can take the club forward." Leicester-born Neal began his career with Stoke City where he made over 80 appearances. A move to Preston followed in the summer of 2005 in a deal that saw Marlon Broomes move in the opposite direction. 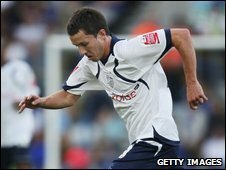 The left-sided midfielder made 73 appearances and scored five goals during his stay at Deepdale. "He came up here and we have been able to persuade him that this is the place for him to be," continued Abbott. "We know a lot about him. He's got really good feet, great delivery and will make things happen. "He's an intelligent player and his understanding of the game is first class, so we are hoping that he will give us that little bit extra and help us move forward." Lewis Neal has potential, a tricky winger who should create a good impression in League One. Neal also had a six-game loan spell at Notts County earlier this season. "I just see it as an improvement to the squad," added Abbott. "We have had more than just a good reference from (Carlisle coach) Dennis Booth. "Dennis is good enough for me but there has been more than just Dennis saying how much he thinks Lewis can add an impact to what we have got. "So the homework has been done, we know a lot about him, he is not a shot in the dark so he is a pleasing one to have on board."